Teamwear Ireland Ltd are the Number 1 teamwear and sports kit specialist in Ireland! You can buy teamwear through our website, discuss your needs on the phone or by e-mail, request a visit from one of our sales reps or indeed visit our modern showroom and shop. Whatever way you wish to do business our experienced staff will always be on hand to guide you & will endeavour to meet your needs and expectations as a customer. Teamwear Ireland specialise in the supply of playing kit & leisurewear to all sports. Through our unique relationships with high quality suppliers & brands, we don’t just offer great value for money, but an unrivalled customer experience and service. Our brands are selected on a range of criteria including cutting edge design, new garment technologies, product availability, price, quality & delivery. Teamwear Ireland can offer a huge range of both stock and bespoke (made to order) items. We supply to all sports, with many of our main customers developing a long term relationship with our business. These schools & clubs trust Teamwear Ireland to consistently deliver what they require & many take advantage of our FREE ONLINE CLUB SHOP. Let the coach worry about how the team performs, we'll take care of how you look! 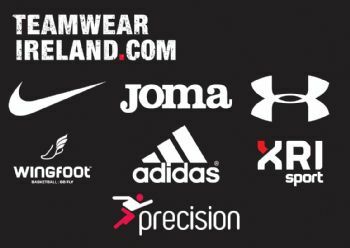 At Teamwear Ireland we can build your club or school a professional and personalised online shop, filled with your own unique range of gear & any extras you may need. This makes it easy for players to order new gear & takes the hassle away from coaches & teachers - saving them from becoming kit men & debt collectors! 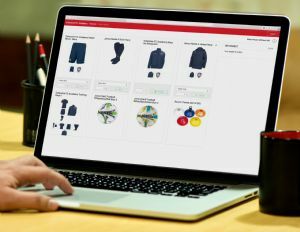 Club shops work perfectly for those clubs and schools looking to create a uniform and organise their sports kit & leisurewear to look and feel like the professionals. If you think this may be helpful to you and your club, please contact us here to find out more details. Teamwear Ireland offer an in-house printing and embroidery service to cater for all your garment decoration needs. Crests, numbers, sponsors logos, player names, initials etc can be applied to almost all of our products to create the finishing touch to the professional image your school or club requires. Teamwear Ireland currently have two showrooms where you can visit to look at our products & discuss your needs face to face with our experienced sales staff. Here you can see a full size range, touch the fabrics and try on whichever garments you may be interested in. It is also a great opportunity to meet our staff & allows us to walk you through what happens when you place an order. We can then discuss your needs, you can investigate how the club online shop works & we can answer any queries you may have. Click here to check out our showroom locations, contact details and opening hours. Our sales represenatives are also available to come to visit you at a suitable time and location. Please contact sales office to arrange. Teamwear Ireland Ltd offer you the complete package for your team & can supply you with playing kit and leisurewear for almost all sports including Football, Rugby, GAA, Athletics Hockey, Cricket, Basketball, Netball, Volleyball etc etc. We are specialist equipment suppliers for all sports - some of this is available from this website, but nowhere near all of what we can supply! If you have any special requests or would like to receive a tailored quote for any order, then please contact our sales office by phone or e-mail and we will always give you a prompt reply. Whether you're a player or coach, amateur or professional, Teamwear Ireland Ltd promise to deal with you with the courtesy, speed & professionalism you deserve.